"St. James Infirmary Blues" (PDF) from the Bob French's Original Tuxedo Jazz Band album, Livin' The Legacy, and compilation Putumayo Presents New Orleans Brass. The devil's song is a slow blues, a heavy shuffle fueled by an eternal fire. Often we forget that the blues represents the feeling of being human, the tension and restlessness of a constant state of limbo, rather than to abide to some heavenly form. The moans, groans, and woes of this life and death are what we try to emulate when we sing the blues. And yet the brilliance of this version's take on the "St. James Infirmary" verses lies in the life-after-death attitude. But she'll never find another man like me"
Through all the troubles that we face in this world, we can take pride that we all live a unique experience and hopefully to the best of our ability. That is worthy of celebration. That is the beauty of the blues, the truth that joy rids humanity of its darkest parts. Also, why can't any trombonist play fluently in a 12/8 meter? I mean, Freddie Lonzo effortlessly holds down the fort on this tune, but he favors the form over the rhythm. 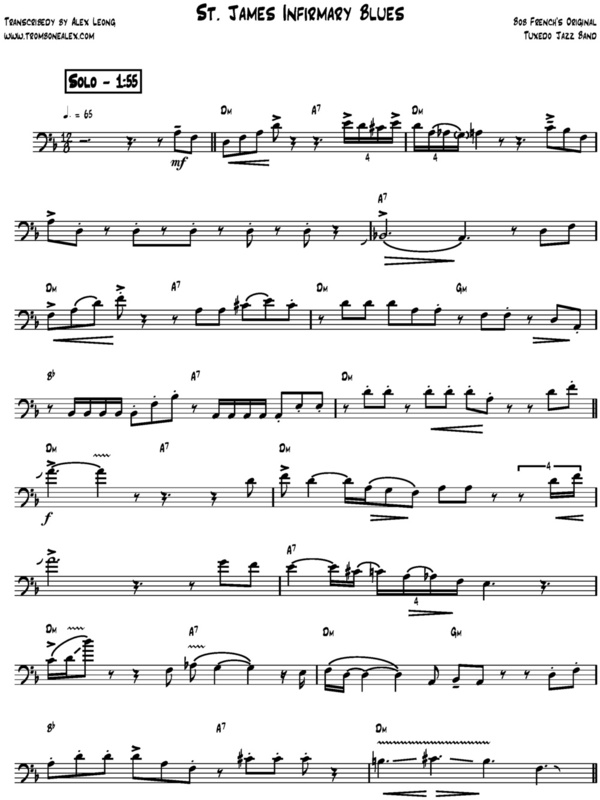 The argument can be made that, when improvising, it can be thought of as two bars of 6/8 meter, but the emphasis in 6/8 is on the one, whereas in 12/8 it is on the two and four. Perhaps the slow tempo of the blues simply encourages a free and expressive attitude towards soloing. But find me a trombone solo in a slow 12/8 that makes a definite rhythmic statement. SPECIAL THANKS to Sam Baker for the comments! Here is a YouTube video of Freddie Lonzo with the Preservation Hall Jazz Band doing his thing on "St. Louis Blues." Notice his use of circular breathing. Recommended Reading: The Royal Road to Card Magic by Jean Hugard & Frederick Braue. Published by World Publishing Company.